FRONT RUNNER: Ivan Lopez on Makalali heads for home in Race 2. 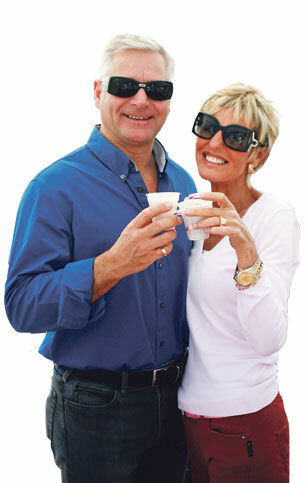 Inset Top: Nicki and Kim fromEWN serve Pimms. Bottom: Brisk Business for bars and cafés. Michel and Steven Euesden were at the Hipodromo for waht turned out to be a gloriously sunny day…and a fabulous day out for all the family. 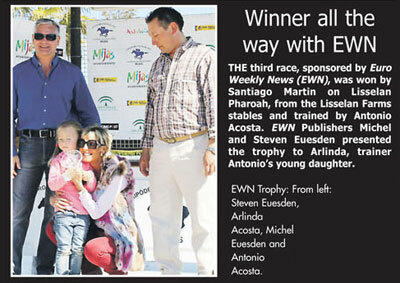 The second day of racing in the winter calendar at Mijas Hipodromo Racetrack on Sunday, included the EWN Trophy Event, attracting young and old alike, and it was a day to remember for everyone. The crowd, estimated at 2,000 ,watched five races, and were entertained by young dancers in between action on the track. There was also a special EWN stall offering free Pimms cocktails to spectators if they completed a special survey on the newspaper. More than 600 spectators handed in completed surveys over the course of the day! Meanwhile cafes and restaurants did brisk business as many spectators enjoyed themselves on the warmest day of the year by relaxing under clear blue February skies. As the temperatures tipped over 22 degrees, many found an added bonus in selecting a winner…but everyone, even those that did not pick a winner, enjoyed themselves. 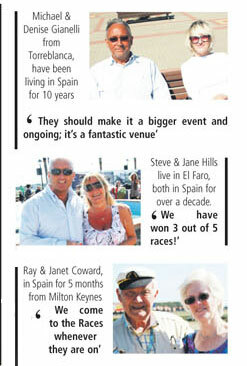 Euro Weekly News owners, Michel and Steven Euesden, enjoying the sunshine. “I would definitely love to come again. The sun, the atmosphere, the racing….it was great. This was a fabulous fun day out and everyone was well behaved. Not one sign of anyone trying to spoil things. The next meet at Mijas Racecourse will take place for the most important race on Spanish turf, the Dia de Andalucia Mijas Cup Grand Prize. One of the 600 people who entered the EWN survey will be chosen at random and win a 32 inch flat screen TV. Watch this space!